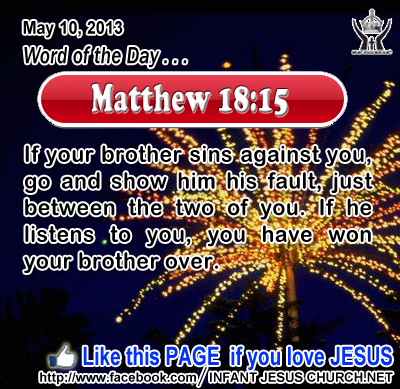 Matthew 18:15: If your brother sins against you, go and show him his fault, just between the two of you. If he listens to you, you have won your brother over. Heavenly Father, forgive our foolish and selfish ways. Give us courage to lovingly confront those who have sinned against us, but if we cannot bring reconciliation, help us through the power of Holy Spirit to forgive as you have forgiven us. In Infant Jesus' name, we pray. Amen. 20Truly, truly, I say to you, you will weep and lament, but the world will rejoice; you will be sorrowful, but your sorrow will turn into joy. 21 When a woman is in travail she has sorrow, because her hour has come; but when she is delivered of the child, she no longer remembers the anguish, for joy that a child is born into the world. 22 So you have sorrow now, but I will see you again and your hearts will rejoice, and no one will take your joy from you. 23 In that day you will ask nothing of me. Truly, truly, I say to you, if you ask anything of the Father, he will give it to you in my name. The cross for Jesus was not defeating but victory, victory over sin, over the forces of evil in the world, and over the devil, the arch-enemy of God and humankind. Through death on the cross Jesus won for us new life and freedom over the power of sin, despair, and death. The Easter victory of Jesus teaches us courage in the face of suffering and death. In the resurrection of Christ our fears are laid to rest. His resurrection is total, final triumph, and for us peace and joy at the end. We will have troubles in the present reality. Through the eyes of faith, we know the last outcome, complete victory over sin, suffering, and death in Jesus Christ. That is why we can pray boldly now, knowing that the Father will give us all we need to live as his children and as disciples of our Lord Jesus Christ. Do we know the Easter joy of Christ's victory over sin and death? Loving Infant Jesus, we are an Easter people, and alleluia is our song. May we give out the joy of Easter and live in the reality of Jesus' victory over sin and death.